Yep, another review. XD I finished Structuring Your Novel by K.M. Weiland about an hour ago. … but the book also includes much about scene and sentence structure — the former of which I had never heard of prior to discovering Helping Writers Become Authors and the latter of which I had never heard of period. I love how she explains each of the structure elements and gives us multiple examples for each one so we can see it in action. It really helps me understand what is being talked about. 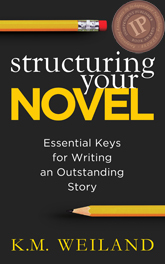 I have happily taken (oh, only about a million or so) notes on (literally all of) the subjects in Structuring Your Novel and am so excited to put this knowledge to use. My first completely pantsed novel seemed so hopeless and worthy of being condemned to death via the trash can icon button — but with what I now know about how to structure a novel properly, I am more than excited to revise and outline (thanks to Outlining Your Novel) it! Thank you, K.M. Weiland, for such an amazing book. Do you remember me talking about joining Wordplayers in my last post? Have you joined them yet? Good, because I just discovered Super Readers, K.M. Weiland’s exclusive group for her fiction readers. You’ve got to join that, too! I’m reading Behold the Dawn right now, but I’ll hold off on the fangirling and raving about its awesomeness for when I finish it. Dreamlander is also impatiently waiting for me in my iBooks library. On a surprisingly related note… I’ve started the brainstorming for Loyalty Book I: To the Death! *screams in excitement* It’s so exciting and exhilarating and ahhh! I’m doing the method K.M. Weiland presented in Outlining Your Novel. I’ve found it really freeing to do my brainstorming on paper like I did during April. In case you forgot — which I don’t know how you could because I talk about it all the time 😂 — that’s my terrible first novel I’m completely replotting and restructuring and revising and rewriting. ^ Yesterday I came up with absolutely fabulously evil ideas including an even more evil and heartbreaking plot point that nearly killed me! 😄 Watch out, all who ship Hinoki and Ari. I AM GOING TO BREAK YOUR HEART WITH MY EVIL MIDPOINT IDEA. What’s up? Have you read any of K.M. Weiland’s writing craft or fiction books? Are you interested in becoming a beta reader for when Loyalty Book I: To the Death is ready for you? I’m so excited, I can hardly wait. I can’t wait to read this!!! I am currently planning my NaNo novel for november (whose current title is horrible and shall never see the light of the day) and editing my Camp NaNo novel (which is taking absolutely. forever.) and this site and book i am sure will help em a lot. Excited o read this! Thank you for helping me discover this amazing site! Oohhh I have to check this out! Hey Madi do you wanna chat for awhile on this post? You totally should! 😀 I actually can’t chat right now :/ Would you like to text soon, though? I am deffanatly going to read this now 😉 when? Do you think? Hurray! 😉 Perhaps a little later tonight? Just text me later tonight and I may be able to chat. Wow that’s so cool! This will help alot Great post madi! I honestly can’t plot (it doesn’t work for me) but I’m SO GLAD that it’s working for you!! I can’t wait to read Loyalty when it’s FINISHED!! Will you be pursuing publishing? Awww thanks! HEHE YAY! Yep, I plan on pursuing traditional publishing!